Artist Gives Old Saints New Faces There are exactly 103 roads named after Catholic saints in Los Angeles. J. Michael Walker has spent eight years exploring these roads and avenues, researching their namesake saints and finding connections with the people who inhabit them. J. Michael Walker reads his story of Jevona, whom he met in Skid Row. Stephanie Raygoza, 9, is an unofficial saint. She died in 2000 after she was hit by a stray bullet while playing on her scooter. Walker was commissioned to create her portrait for her funeral, and thus as "Saint Stephanie" she joined the dozens of other historic figures in the exhibit. J. Michael Walker reads his poem about San Pablo. 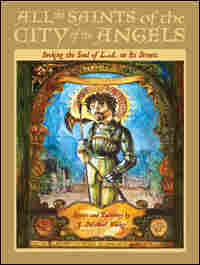 J. Michael Walker maps out Los Angeles by saints in his book, a blend of paintings, photos and narrative. Jevona came to Los Angeles to become a star. But when she went to have her head shots done, the photographer asked her to undress for him. It's a common tale in the City of Angels. When the beautiful homeless woman shared her story with artist J. Michael Walker, however, he saw it through a rather different lens than most — one reflecting Roman Catholic saints. There are exactly 103 roads named after Catholic saints in Los Angeles. 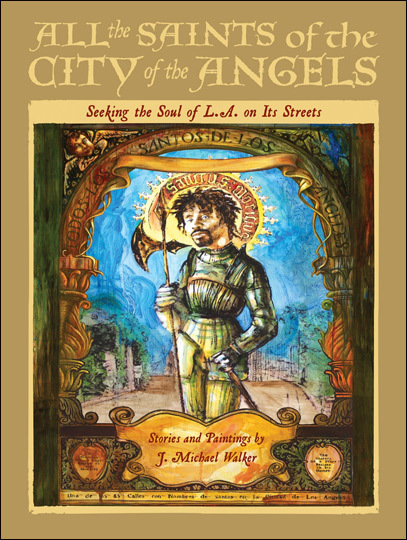 Walker has taken it upon himself to map the city according to these saints; he's spent eight years researching them, exploring their namesake streets and painting new portraits of them using the faces of people he met. People like Jevona — whom he encountered in downtown Los Angeles, in a neighborhood called Skid Row. "She seemed totally out of place with the trodden-down, beaten-down place in the middle of Skid Row," he recalls. "I asked her if I could take her photograph and she looked up and said, 'I've been waiting for someone to take a good photograph of me.' "
As she told of being taken advantage of by man after man, he was struck by how her tale paralleled the story of Ynez, one of the virgin martyrs, killed for standing up for herself. Jevona thereby became the new face of Santa Ynez. "By seeing these historical or legendary characters with the faces of people you could pass on the street any day, it helps us see it as something that's relevant to our lives," Walker explains from an exhibit of his paintings and narratives at the Autry National Center in Los Angeles. "The themes that animate history are themes that resonate in our lives all the time." At the beginning of his project, Walker started making portraits of homeless people living on San Julian Street, also in Skid Row. 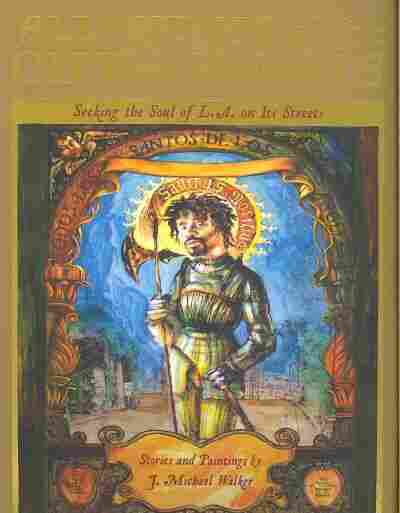 He was struck by the confluence of story and circumstance; San Julian is the patron saint of wanderers. "Here it is the street that's named for him is where the wanderers gather and where the clinics that serve the wanderers are located," he says. Each of his portraits, like the saints and stories that inspired them, are totally distinct. His "Santa Monica" incorporates the faces of mothers with sons in prison. 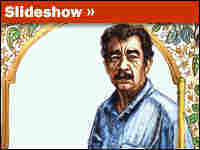 "San Ysidro" resembles one of the many gardeners who tend the grounds on that plush Bel Air street. One black-and-white portrait stands out among the collection — a little girl with butterfly wings. The sun cries fat tears above her. "Good luck in heaven" is written in loopy script below. Her left hand rests on her heart; her right hand holds what looks like a valentine. Stephanie Raygoza, 9, is an unofficial saint. She died in 2000 after she was hit by a stray bullet while playing on her scooter outside her house. 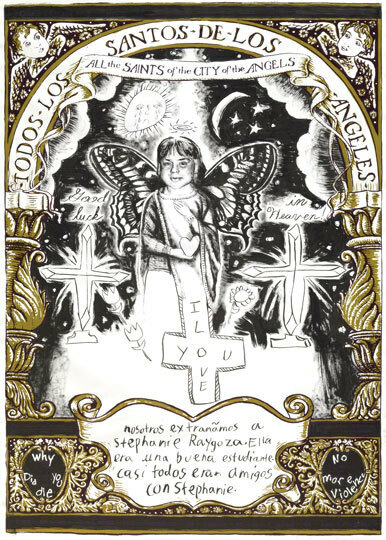 Walker was commissioned to create her portrait for her funeral, and thus she became "Saint Stephanie." Saints are part of everyday life for so many Angelenos, Walker says. They're in our streets, on our walls, in our memories, receiving our hopes and dreams and prayers with open arms. The exhibit reinforces these connections. One of the museum guards loved the image of San Miguel so much he asked permission to have it tattooed on his chest before he leaves for Iraq in October. "If you can find the sacred in the world around you, rather than in something that's distant and apart from you," Walker says, "then maybe you can be better integrated to the world you live in." J. Michael Walker's saint portraits will remain at the Autry National Center through Oct. 5. The exhibit will be on display downtown, at the Cathedral of Our Lady of the Angels, starting November 1st — All Saints' Day. 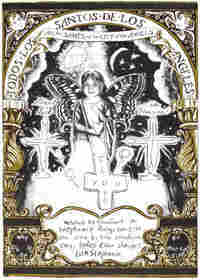 You can also find them in his book, All the Saints of the City of Angels.